For the fourth year in a row, Point Park University students didn't have to travel far to learn about internship and job opportunities in media, live entertainment, performing arts, sports, nonprofit and more. Approximately 65 employers came right to campus for the Sports, Arts and Entertainment Management Career Event, hosted by the SAEM department, School of Communication and Career Development Center. More than 350 people attended the career fair, which was open to all majors at Point Park as well as college students throughout the Pittsburgh region. "We have had fantastic experiences with Point Park students as both interns and employees. They are focused, driven and very knowledgeable about the inner workings of the entertainment/facility management industry," said Maureen Jones, human resources manager for the CONSOL Energy Center/AEG. "I would love to be invited back next year!" Chelsey Driskel, a freshman public relations and advertising major, went to the career fair to get real-world experience networking with employers. "I want to work in an advertising firm after graduation," she said. Driskel met with employers from the Pittsburgh Pirates, GNC, Highmark Stadium and CONSOL Energy Center/AEG. "The career fair provided a good chance for me to look for internships for this summer. I would like to round out my experiences with an internship in production before I graduate in December," remarked Clayton Stasenko, a senior SAEM major. 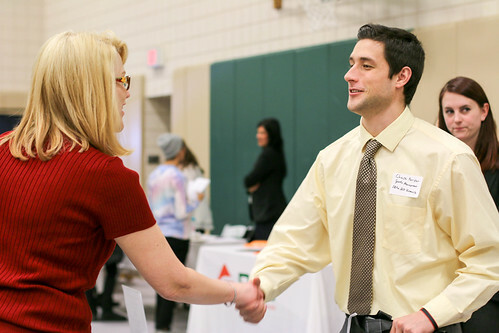 According to Angela Scaramucci, coordinator of employer relations for the Career Development Center, the main goal for holding on-campus career events are to maximize job opportunities for Point Park students and alumni by helping them make connections and form relationships with a variety of employers. "Phipps has had Point Park students and alumni serve as both interns and employees in various departments. We are continuously impressed with their high quality and level of commitment to service within our organization," remarked Ashley Dean, human resources coordinator for Phipps Conservatory and Botanical Gardens. Check out additional feedback from employers below. "Thank you again for another fantastic career fair! Of all the fairs we do, Point Park University continues to be the most successful recruit rate for us and also the most organized and effective." - Shawn Arnold, director of operations/staff manager, ELF Entertainment, Inc.